It seems to be a pretty even split when it comes to the preference if the house thermostat should be made colder or hotter during the night. If it’s anything like many couples we’ve talked to, the husband always wants it colder, and the wife always wants it warmer. 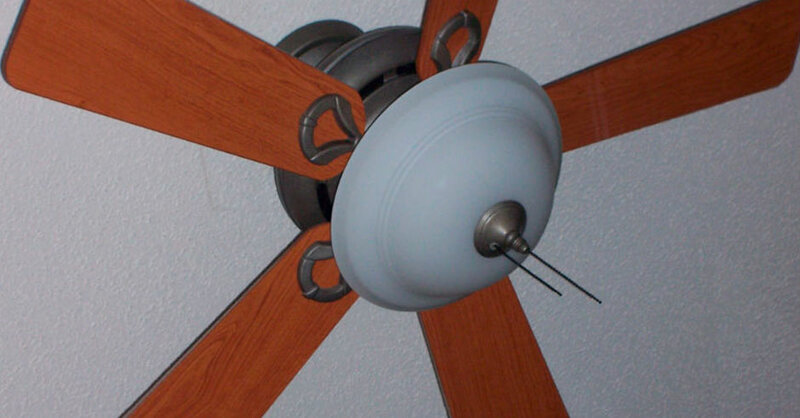 However, most people can agree during a hot summer night it’s always a good idea to put the ceiling fan on. Or is it? Up until now most people thought keeping a fan on is harmless, but that might not be true. When you let the cold air constantly hit your body, you could wake up with stiff and sore muscles. The reason behind this is simple, cold air concentrated on one part of your body will cause the muscles it hits to tense up. Considering most people sleep on average 8 hours a night, that’s a long time for a muscle to tense up. This is one of the more common reasons people wake up with a stiff neck. If you take a look at most people’s fan blades you’ll likely find some amount of dust. This just means dust and allergens are being tossed all around your room, making you feel “sick” when you wake up in the morning. Breathing in allergens all night while you sleep can’t end well, and it usually doesn’t. Air is obviously something that dries anything out, that’s why you find air blowers in bathrooms to dry your hand. Well, the same way a fan can dry your hands out, it can and will dry out your sinuses. If the dryness is severe enough it could leave to a sinus headache, something no one can possibly enjoy. Even though there are all these possible side effects from keeping a fan on while you sleep, most people think the alternative is much worse; sweating while you sleep. But not all hope is lost, there are steps you can take to help protect yourself.